Here's a new giveaway for our lovely readers. Enter to win a copy of this cute journal that Rachel blogged about it recently, "Keep Calm And Have A Cupcake". The good folks at Peter Pauper Press have offered to give one of the journal. Submit your entry here. The contest will end on Tuesday, April 6. In June, we will be doing another giveaway for Boston's Sweet cupcake recipe book when it is released. 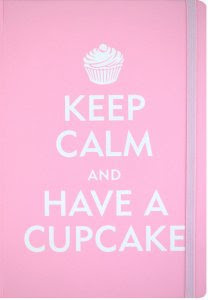 Also, check out Peter Pauper's site for "Keep Calm and Have A Cupcake" bookmarks, gift bags and note cards.